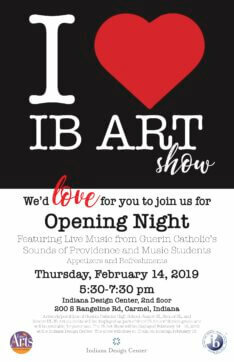 Date: Thursday, February 14, 2019, 5:30 p.m. – 7:30 p.m.
Join Guerin Catholic High School art students for their IB Art Show opening night. Live music will be featured, by Guerin’s Sounds of Providence and music students. Appetizers and refreshments will also be served. The show will run all weekend, Thursday, February 14 – Monday, February 18, 2019.